A couple of weeks ago, I put up a page on the 'terrestrial penguin' Cladornis pachypus, described from the Oligocene of Patagonia by the Argentine palaeontologist Florentino Ameghino. As it happens, Cladornis wasn't the only unusual penguin recognised from the Patagonian fossil record by Ameghino nor was it even necessarily the most unusual. That title should probably go to another species, the wingless Palaeoapterodytes ictus. 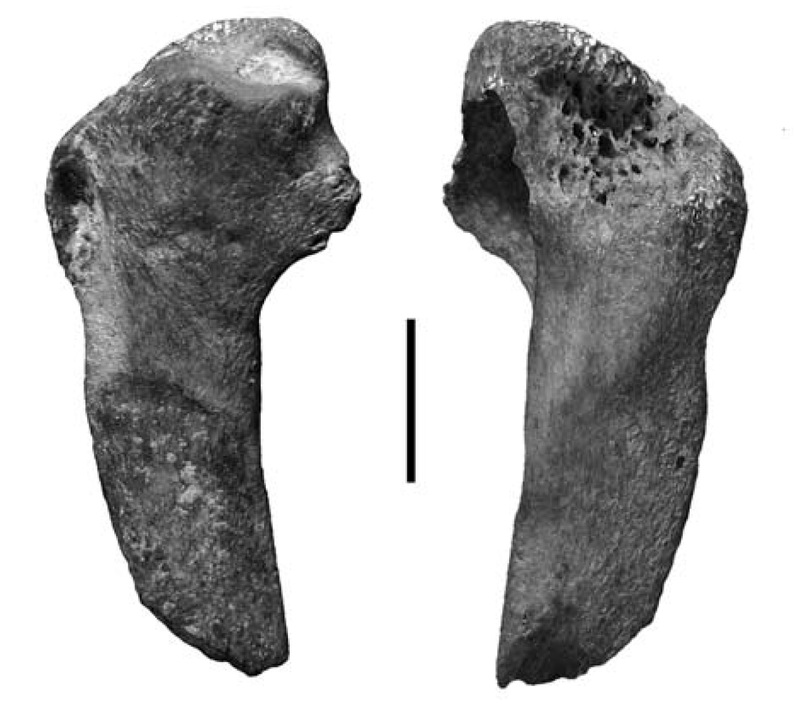 Anterior (left) and posterior view of humerus of Palaeoapterodytes ictus, from Acosta Hospitaleche (2010). Scale bar = 10 mm. Like Cladornis, Palaeoapterodytes was based on only a single bone, in this case a humerus (upper wing bone) from the Early Miocene. And also like Cladornis, Ameghino's description of this bone indicated a truly remarkable bird. The distal part of the humerus lacked any sign of the facets that would normally articulate with the succeeding wing bones and, as a result, Ameghino concluded that the wing skeleton had been reduced to the humerus only. The crest and pits on the humerus marking the attachment of the wing muscles were also reduced. Ameghino's Palaeoapterodytes presumably had wings reduced to the merest nubs, effectively functionless and probably of little mobility. Nevertheless, the humerus of Palaeoapterodytes remained relatively robust, its breadth little less than that of other penguins. I am not aware of any other bird with a wing structure anything like this. In other birds without functional wings, the entire wing skeleton becomes reduced, not simply truncated. Perhaps the closest approximation I have found is the wing of Hesperornis, which also lacks known wing bones beyond the humerus. However, the Hesperornis humerus is slender and gracile, and even without direct indication of the presence of more distal bones, it still looks to retain some remnant of the ancestral articulation. Also, the whole concept of a wingless penguin is decidedly problematic. Hesperornis derived its main propulsion in swimming from its feet and so its wings became reduced because they served little function. Penguins, on the other hand, get most of their propulsion from their wings, swimming in a manner that has been compared to flying underwater. Despite being flightless, penguins retain a wing skeleton that is, if anything, even more well developed than that of their flying relatives. For Palaeoapterodytes to have lost functional wings, it would have somehow had to change its mode of propulsion. Reconstruction of the Palaeoapterodytes humerus with missing sections restored, from Acosta Hospitaleche (2010). As a result, even while authors were cautiously considering Ameghino's interpretation of Cladornis, they treated Palaeoapterodytes with more scepticism. This scepticism was eventually concerned when the humerus was re-examined by Acosta Hospitaleche (2010). The reason for the lack of structure at its distal end was very simple: the original distal end had been broken off. The apparent lack of development of the muscle attachment structures was the result of erosion, not any indication of the bone's original appearance. When alive, Palaeoapterodytes had probably been very similar to, if not identical with, one of the several other penguin species known from around the same time and place. Unfortunately, the state of preservation of the type humerus is so poor that its exact identity cannot be determined, and Palaeoapterodytes ictus has been cast into the taxonomic limbo of nomen dubium. Ameghino's Cladornis may remain an intriguing mystery, but his Palaeoapterodytes is just a red herring. Acosta Hospitaleche, C. 2010. Taxonomic status of Apterodytes ictus Ameghino, 1901 (Aves; Sphenisciformes) from the Early Miocene of Patagonia, Argentina. Neues Jahrbuch für Geologie und Paläontologie—Abhandlungen 255 (3): 371–375.